Caltrans released its new Strategic Management Plan [PDF], and it includes priorities and performance targets that show the department is serious about reforming itself. The new plan includes active transportation and Vision Zero, within its priority number one, “Safety and Health.” It also cites a goal of tripling bicycle mode share and doubling walking and transit mode share by 2020–that means not just the number of trips, but the percentage of total trips in California. This is a major turnaround for the state DOT, which in the past has focused on motorist safety. The mode share target is called out under the goal of “Sustainability, Livability, and Economy.” That broad goal also includes lowering vehicle miles traveled (15 percent by 2020) and reducing the percentage of greenhouse gases from transportation (to match current and proposed state mandates). The Strategic Management Plan is an in-house document, meant to guide decisions made by planners and engineers in the course of planning and completing projects statewide. It stems from the new Caltrans mission, to provide “a safe, sustainable, integrated, and efficient transportation system to enhance California’s economy and livability.” The new mission statement was a response to harsh criticism of the department’s old way of doing things. Teams of staff members from Caltrans headquarters and all its districts have been working on formulating goals for the past year, and will continue to work on refining them and coming up with performance measures to gauge success. Cliff describes the process of creating the plan as collaborative and enthusiastic, involving “detailed, vibrant discussions” among staff about how to create metrics that could achieve their goals. Under the first objective above, the current performance measure is an increase in bike, walk, and transit mode share, with the targets being tripling bike mode share and doubling walk and transit mode share, based on the 2012 California Household Travel survey [PDF]. That survey showed that bicycle mode share in 2012 was 1.5 percent (up from 0.8 percent in 2000), walking trips were 16.6 percent of all trips, and transit trips were 4.4 percent. 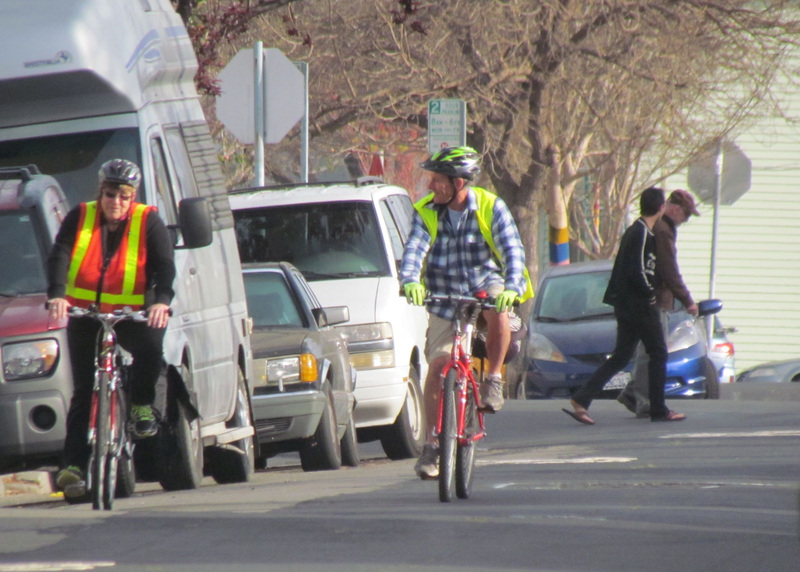 So Caltrans is committed to supporting an increase of bike trips to 4.5 percent of all trips in California in the next five years, plus increasing walk trips to 33 percent and transit to almost 9 percent of all trips. Of course that also means lowering the share of car trips by an equal amount, dropping from about 3/4 of all trips to about half. This is an ambitious goal, but anyone paying attention to the urgency of addressing climate change knows it is necessary. The next question is how to get there. While Caltrans has some control over funding, it doesn’t make every transportation funding decision in the state. And funding is key. If the State Transportation Improvement Program (STIP), which sets priorities for highway spending, continues to prioritize funding for highway expansions, it will be difficult for the relatively tiny Active Transportation Program to make much of a difference. The STIP guidelines [PDF] are currently under review and will be adopted this summer. These new performance targets should be used to inform that process. Caltrans can’t achieve these goals alone. However, the mere fact that the department is publicly committing to goals including tripling the share of bicycle trips in the state will lend traction to resisting business-as-usual. Like the California Transportation Plan 2040, it is a good start. While Caltrans does not have jurisdiction over local transportation planning or policies, it does wield considerable influence over local planning decisions, and it provides expertise and guidance. A statewide plan that provides a cohesive vision for safe, comfortable biking and walking in California communities is an important step. This statewide bike and pedestrian plan should also rightfully serve as the underpinning for local and regional bike and pedestrian plans, and for that reason alone needs to be a strong statement about the relevance and importance of encouraging these active modes of transportation.